This hesitance comes out in the taxi ride the three share to their respective destinations. Homer's house comes first, and the disabled sailor's can-do attitude dissipates as he nears his family's porch. He suggests they all go back to his uncle's bar and have a drink first, said in the tone of a man casually seeking a way out of his certain death. Even Al, older than the others by more than a decade, asks for Fred's stop to be the second destination to put off his own return. The three men feel so uncomfortable back in their respective haunts that before the day is done, all of them find themselves belatedly taking Homer's suggestion and ending up in that bar. The rest of the film weaves in and out of the men's lives as they attempt to rejoin a society that seems so different to them now. Fred stops in for a quick visit at his parents' working class hovel of a home and leaves just as fast, having no desire to endure his father's inability to talk to his son or his mother's oblivious questions about what he had to do to get all those medals and ribbons. Suffering from PTSD, he tacitly wants financial compensation for his trauma in the form of a better lot in life. But with so many soldiers returning home, a bum resumé looks only marginally better for a war record attached, and Fred must go back to his prewar job as a soda jerk. His own anger over this insult is nothing compared to the outrage of his wife, Marie (Virginia Mayo), who clearly enjoyed herself in her husband's absence and chafes under his presence. Al also resumes his old job, though he works at a bank. But if Al at least gets to come home to a fat paycheck, he expresses as much enthusiasm for his position as Fred does for his. "Last year it was kill Japs. 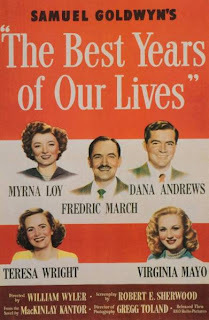 And this year it's make money," he tells his wife, Milly (Myrna Loy), ruefully encapsulating the unwritten, unspoken social directive to move past the war as quickly as possible. Of the three main characters, Al has the easiest life ahead of him. Not only does he have a cushy job guaranteed, Al also enjoys the support and devotion of his wife and two children. Yet his relative comfort may be a source of guilt; when a Navy man applies for a small loan to buy a farm, Al reviews his lack of collateral and funds and seems about ready to deny the request, only to be overcome by a sense of duty to a fellow veteran. Furthermore, Al flirts most dangerously with alcoholism, dragging Milly and even his young daughter for a night of drunken carousing visualized by a slurred montage of superimposed nightclubs and later nearly botching a big speech at a company banquet by inadvertently criticizing banks' greedy impulses. But the best and most affecting story is Homer's. 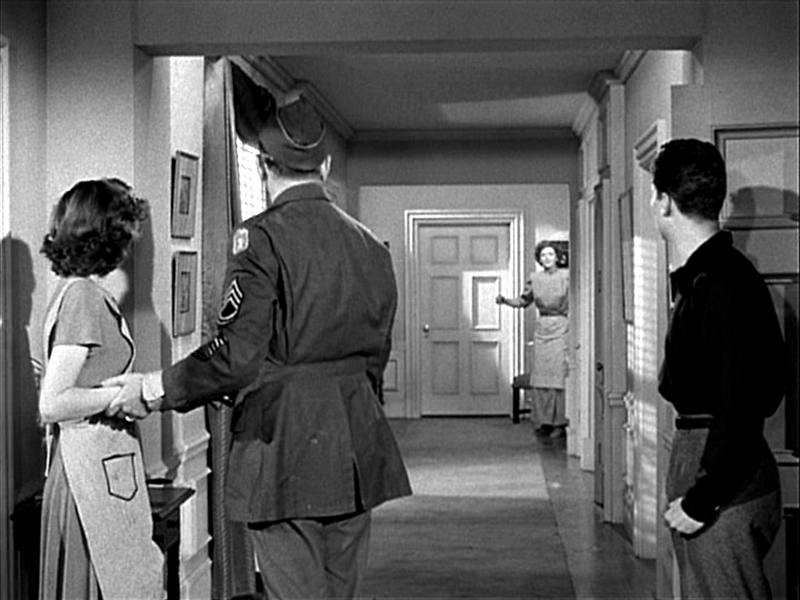 Wyler cast Russell, a nonprofessional actor, because he really did lose his hands during the war. To have lived that sacrifice does not necessarily mean one can portray it on the screen, however, yet Russell's performance pulls together the naturalistic style of the cinematography and editing. Wyler and Toland place Russell center-frame and nearly alone in his distance plane in long shots of Homer sitting with his shoulders hunched and his face drawn in shame as his family and that of his girlfriend, Wilma (Cathy O'Donnell), speak about him as if he were not there, either ignoring him or conversing with each other about what Homer can or cannot do. On the plane home, Homer showed off his ability to light a match with his claws, as much a feat to put the other two men at ease as himself. But sitting miserably in his parents' home, Homer literally jumps at the chance to light Wilma's father's cigar, but the man, not realizing the offense, politely refuses the lad's help. As the film wears on, Russell's jocular forthrightness regarding his disability gathers a rougher edge, a sardonic bite seeping into his conversation. Before one man can even asked what happened, Homer cuts him off with a sarcastic response. In one of the film's most striking moments, Homer grows so paranoid and self-conscious about his looks like the rams his hooks through a window to scare his little sister and her friends peering in at him. Even this outburst, though, is handled with considerable believability and humanity by Russell. Russell's performance is indicative of Wyler's quest for naturalism, which does not entail strict realism so much as an honest, giving style that lets his actors ease into what might have been an overbearingly preachy script. Long takes generally placed at some level of critical distance emphasize the waves of alienation and uncertainty emanating from the returned soldiers. Toland's deep focus is used exceptionally throughout: when Al embraces Milly after years apart, the camera remains in its original position adjacent to the door as Al walks back down the hallway; the shot is crisp, but its distance makes the audience feel like an eavesdropping spectator, gawking along with the kids at a private exchange. Back at the drugstore, Toland and Wyler routinely place the callous boss in a transparent office high above the showroom floor, constantly watching as if looking for an excuse to sack Fred. Most stirring of all are the shots of an airplane graveyard that look almost surreal as propellors and fuselages stretch in perfect formation to the farthest distance of the frame. The stacked engines resemble their own tombstones as they lie vertically on the ground, while the gutted plane husks produce a cognitive disconnect between the neat, disciplined arrangement of the aircraft and their tattered, stripped look. But even this scene feels real because it is, shot at an actual field breaking down derelict and excess aircraft after the war. This field even connotes its own sense of beauty, the planes being torn down to build VA housing in a modern take on beating swords into plowshares. Supporting performances aid the overall mood of somber humanity as well. Hoagy Carmichael does a great deal with the handful of lines he receives as Uncle Butch, urging his nephew to be patient with his loved ones in a tone of considerate advice between relatives who see each other more as pals the way aunts and uncles so often do with nieces and nephews. Minna Gombell has even less to work with as Homer's mother, but she instantly makes an impression upon seeing her mangled son and only just managing to transform an unstoppable sob into a cough before the sound fully escapes her throat. The finest of the supporting players is Teresa Wright, giving characteristically unimpeachable work as Al's daughter and a love interest for Fred. She takes a part that could have shattered the low-key, realistic narrative and turns it into the most believable character in the film, or at least no less natural than Russell. Both naïve and wise, Peggy realizes how ridiculous her crush on the married man is, but when she announces to her parents her intentions to break up Fred and Marie, Wright delivers the line with casual conviction she might as well be listing her errands for the day. Released so early after World War II, The Best Years of Our Lives proves prescient in its sober appraisal of the uncertainty created by the war and its discomfort by the speed with which American society covered up the realities of war to bask in the country's new position as an undisputed economic and military superpower. Here, Wyler shows the audience some of the cracks in that damn of obliviousness. Rob, Al's son who has already become obsessed with the implications of The Bomb, receives spoils of war from his father in the form of a sword and flag taken from a dead Japanese man. Rob thanks his father the way someone thanks their dog for bringing a dead bird into the house, clearly horrified at these tokens of death. Elsewhere, the instantaneous push for enmity with the Soviet Union leds to an infuriating exchange between a clueless old pre-McCarthyite and Homer: the man tells Homer he lost his hands to the wrong enemy, as if somehow his sacrifice would have meant more had he given his hands to Stalin instead of Hirohito. These fears for the world's future only make the title further ironic, which could make the relative happiness the characters find by the end of the movie seem contrived. But Wyler makes their satisfaction and successful readjustment hard-won and muted, offering a rare Hollywood ending that follows logically from an emotionally harrowing story.